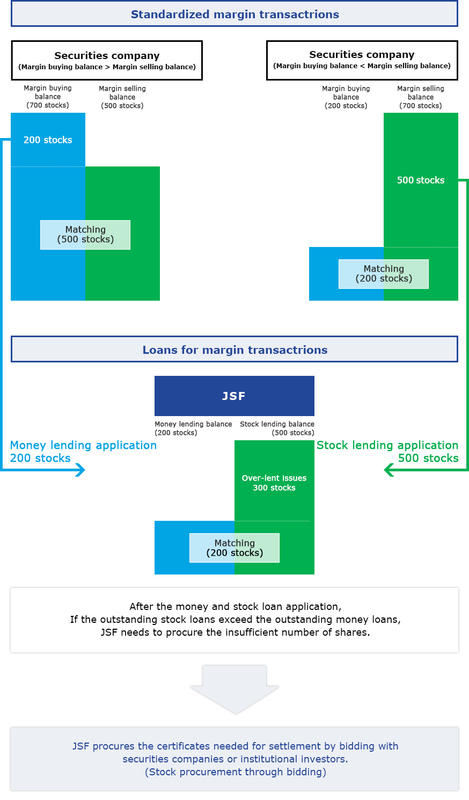 Securities companies can make internal matching between the cash and the stocks to be lent to its customers who conduct standardized margin transactions and, when necessary, can make use of Loans for Margin Transactions conducted by JSF. Similarly to the above securities companies, JSF can also make internal matching between the cash and the stocks to be lent to securities companies. Should the stock lending balance exceed the money lending balance, JSF procures the stocks needed for settlement by bidding with securities companies, institutional investors, banks and other sources (stock procurement through bidding). The highest bidding rate to cover the last remaining shortage becomes the lending rate (Premium Charge) of that issue. This Premium Charge is applied to all users of standardized margin transactions, and should be collected by all sell sides and paid to all buy sides or allotted bidders.